There are many stereotypes when it comes to bachelors, and some of them are true. Let’s face it: no partners plus no kids equals fewer responsibilities. As a result, some of those everyday jobs start to fall by the wayside, resulting in messy homes, empty fridges, and dirty clothes littering the floor. You may have previously had someone who did your laundry for you, resulting in you having no knowledge of how to do this common chore. However, we come not to judge bachelors, but to inform them! 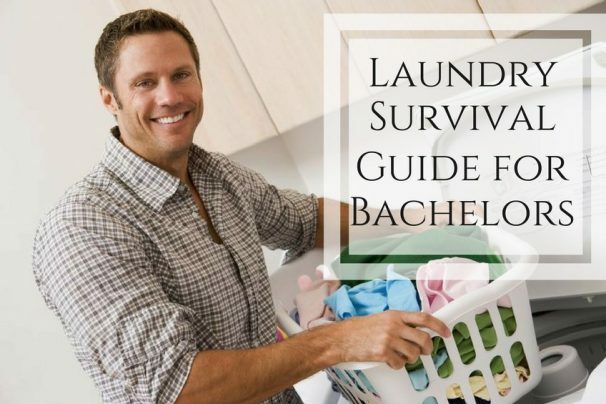 Hence, this handy laundry survival guide for those men out there who aren’t too skilled or dedicated when it comes to the art of clothes washing. If you don’t have access to a regular washing machine, you will have to go to a laundromat. Cost varies, but almost all will have a change machine on-site. If you are in an apartment building, it probably has its own machines that will accept cash or take a laundry smart card available from your superintendent. Most common laundry detergents will do the job, but check the machine first. Some machines will only accept liquid detergent, not powder. Also, if the machine is high efficiency, you don’t need to use a lot of detergent; check with the superintendent or a laundromat worker to find out. Using too much detergent not only wastes money, but can cause excess suds. This means your clothes will not rinse properly. There are also high-efficiency detergents designed specifically for these machines. If you have a choice, powdered detergents are effective for general stains, like ground-in dirt from a football game. Liquid detergents are great for stains like food or grease. But either one should fit the bill for your typical bachelor. Yes, it can save time and money to do large loads, but be careful what you put in there. For example, washing your white sheets, red socks, and brown t-shirt together could result in no more white sheets. Make sure all whites are in a separate load. It is safe to use bleach with whites—do not use bleach with colours, unless you think your blue and brown shirts would look better with a bunch of random white patches on them. Hot water sounds like the best way to wash clothes and, in most ways, it is. However, clothes can shrink in hot water, so be careful. Cold water is not as effective at cleaning, but safer. Some machines contain a size of load option; choose the one best suited to the amount of items you put in the washer. Also, remember that not all clothes can go into the washing machine. Some require hand washing or dry cleaning and will be ruined if put in with your socks and underwear. Check the item for tags, as they will usually have the cleaning instructions listed there. If you found the washing machine settings confounding, don’t worry: the dryer is much easier. Choose the setting that best reflects the amount of clothes in your load. The Regular/Heavy setting uses more heat and gets everything dried faster, but Permanent-Press items should not go in this load as they can fade. Including a fabric softener sheet in the load will help to prevent static cling, improve the feel of clothes, and leave them with a nice scent. Do not put items in a dryer that are likely to shrink (e.g. sweaters) or be damaged from all of the spinning and tumbling (e.g. running shoes). Laundry really isn’t that difficult. Like all skills, it’s something you can easily master with practice. Try to do it regularly, rather than when you find yourself with no clean clothes. Make it a part of your regular weekly schedule and you will always have something fresh and clean to wear.